Today is Avani Avittam celebrated by all Brahmins in South India and also in Orissa as Shravan Poornima. For more info on this from wikipedia click here.Mostly Rakhi and Avani Avittam falls on the same day. Its also called Upakarma. Early morning traditional food is prepared without onion and garlic. All men at home will change the sacred thread and perform rituals. Tomorrow thats next day they will read Gayathri mantra 1008 times. Back at home remembering my brothers usually will tie Rakhi once they finish this puja. So treating them with these dishes from my kitchen. My Menu for the day was. Breakfast with Yummy soft Idlis. Leave me comments or vote which recipe you want me to post first. Hi Saraswathi, so impressed with your blog. 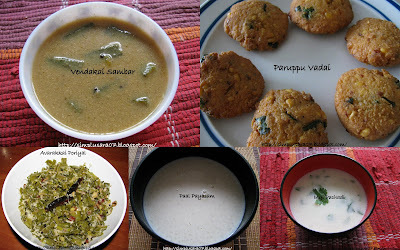 Gives me all the food listed and preparation for coming varalakshmi nombu and avani avittam. Thanks a lot!! Thanks Priya for visiting my blog and your lovely comments. Keep visiitng.